WASHINGTON (Nov. 17, 2011) -- More than a dozen Soldiers showcased explosive ordnance disposal equipment on Capitol Hill, Nov. 17, as part of an "inaugural event" for the recently formed House EOD Caucus. Many of those Soldiers came from the 55th EOD unit out of Fort Belvoir, Va., which provides EOD support in the National Capital Region by providing assistance and expertise to the civilian bomb squads already operating there. Representatives Rick Crawford and Susan Davis, co-chairs of the House EOD Caucus, met with Staff Sgt. Josh Bowden, 55th Explosive Ordnance Disposal, and Pvt. 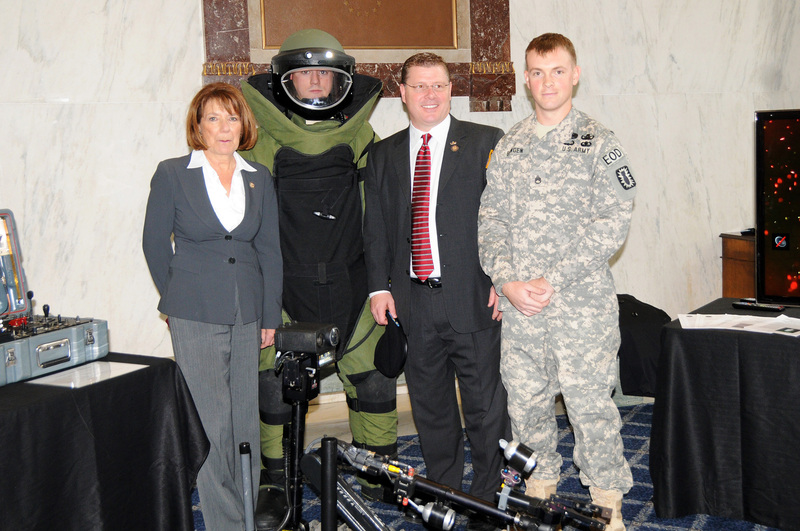 1st Class Thomas McCockill, 55th EOD (in bomb disposal suit) on Capitol Hill, Nov. 17. The lawmakers asked Soldiers with the 55th Explosive Ordnance Disposal to appear on the Hill to answer questions from lawmakers about their work, and to show off their equipment. The 19-member House EOD Caucus is co-chaired by Congressman Rick Crawford, of Arkansas, who served in the Army in the late 1980s as an EOD technician. 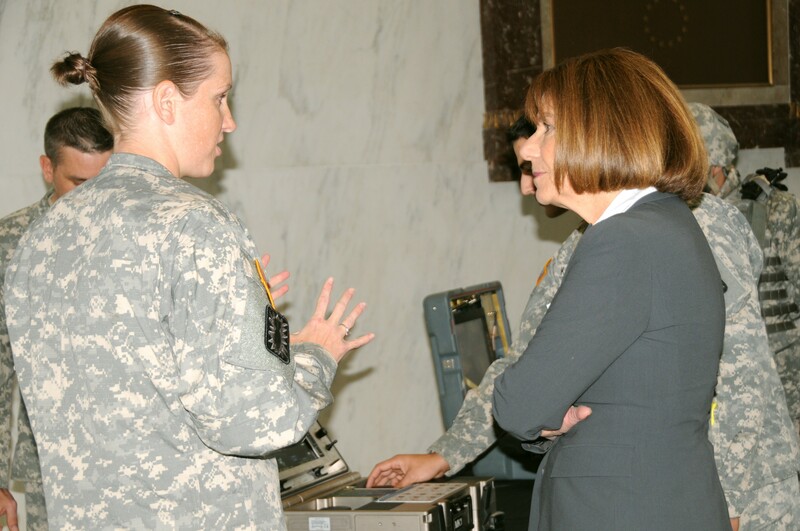 It was Crawford, along with co-chair Congresswoman Susan Davis, of California, who requested support from the 55th EOD unit. "I think this is an opportunity to shed some more light on what are the key enablers in the War on Terror, with respect to counter-IED operations," Crawford said. "We want to educate our colleagues and make sure they understand how critical this is in making sure that we can adequately address the War on Terror through our counter-IED operations." Davis said the education she hopes fellow legislators will get from meeting with EOD technicians one-on-one will help lawmakers make decisions that can help save the lives of Soldiers. "To me it is about saving lives, actually," she said, adding that it's important that EOD Soldiers are enabled with the tools needed to better anticipate life-threatening danger in theater. "We want to be able to do that," Davis said. "A lot of people have devoted their lives to be able to find a better way to be in such a dangerous war theater, where you are not fighting an enemy, you are fighting devices like these." Lawmakers from both sides of the aisle were free to visit the EOD displays in an atrium of the Rayburn House Office Building throughout the day. At one table, Sgt. 1st Class Sean Conley, an EOD technician with the 55th EOD and an 8-year Army veteran, showcased both the tools of his trade, as well as some example of unexploded ordnance he might be called on to disable. He explained a piece of EOD equipment technicians use to investigate explosives, an x-ray system with a portable x-ray source and imaging system that hooks into a computer. Capt. Emily Spencer, commander, 55th Explosive Ordnance Disposal unit, Fort Belvoir, Va., meets with Congresswoman Susan Davis on Capitol Hill, Nov. 17. Davis, and Congressman Rick Crawford, are co-chairs of the House EOD Caucus. The two asked Soldiers from the 55th EOD to appear on the Hill to answer questions from lawmakers about their work, and to show off their equipment. "It's just like going to the doctor's office," Conley said. "What this does is it lets us see inside of whatever our package is." The x-ray unit was set up next to a mortar, but he said the system works with an IED as well. "We deal with anything that goes boom," he said. "If there are explosive hazards that reside in any piece of equipment or device or munition -- we are the ones that come and take care of it. We remove all explosive threats." Conley has deployed twice to Iraq, once on a 16-month deployment, and the second time on a 12-month deployment. He couldn't say how many explosives he personally dismantled there, but his unit, he said, went out on about 4,000 calls during his first deployment -- that's about eight calls each day. At a nearby table, Spc. Nik Karahalios, also with the 55th EOD, showcased both the PackBot, and its larger, meaner looking brother, the TALON. Both are remotely controlled robots that allow EOD technicians to get some standoff from an explosive threat as they dismantle it. "They have kind of the same capabilities, they both have claws and everything we can use to pick up what we need to," Karahalios said. Karahalios has been to Iraq, but as infantry, not EOD. He switched to EOD about a year ago, but has yet to deploy as a bomb disposal technician, though he says he's ready to go "if my country asks for it." Equipment like the PackBot and the TALON allow EOD technicians to keep a safe distance from an IED, for instance, and reduce the threat that somebody might be injured or killed while disposing of it. Representatives Rick Crawford and Susan Davis are co-chairs of the House EOD Caucus. The two asked Soldiers with the 55th Explosive Ordnance Disposal unit, Fort Belvoir, Va., to appear on Capitol Hill, Nov. 17, to answer questions from lawmakers about their work, and to show off their equipment. "In our job field, distance is our friend," said Sgt. 1st Class Bryan Layne, an EOD technician with the 55th EOD unit. "If we can do this from 300 yards away with that robot, I'd rather do that then send one of my guys to have to put that suit on and do that manually." Layne said he's been in the Army for 11 years, and that the explosive threats he and his teammates are asked to deal with have evolved over the years. "A lot of things we dealt with pre-9/11 were a lot simpler explosives," Layne said. "It was a lot simpler when it came to IEDs. Somebody built it in their garage, they came up with it, it was their idea. It was a lot simpler time. You had a higher probability of not running across anything complex." Conley said older explosives were like "that standard clock with some dynamite you see in cartoons a lot -- that was the typical style of device." Now, he said, technology and electronics advancements, have made IEDs more complicated. What has also advanced, though, is the technology EOD technicians use to disarm those explosives. Crawford, who left the Army in 1989, said the technology Soldiers use today in EOD is a "quantum leap forward" from when he served. "The mission has changed, certainly, but the technology has allowed them to prosecute that mission much more effectively," Crawford said. He cited the robots, the 50 cal. dearmer and even the bomb disposal suit as examples of that advancement. "The newer generation of bomb suits -- we were in a first generation bomb suit that were not very effective," he said. "And just the level of technology and skill that these EOD Soldiers have to learn and apply is tremendous." Crawford said as a result of EOD Soldiers appearing on Capitol Hill, he hopes his fellow members in Congress will be more equipped to support EOD Soldiers by investing in the right technology. Both the battlefield and the EOD mission will change, and EOD Soldiers must be equipped to "adapt in a very fluid way" Crawford said. "We need to make sure that they are equipped adequately to make those adaptations in a changing battlefield."